In Lynn Valley, you’re never far from trail networks that offer everything from a fifteen-minute stroll to several-hour, challenging backcountry adventures. Bordering the Lynn Valley community and easily accessible via public transit are three huge, adjacent wilderness parks that offer unparalleled outdoor recreation opportunities. Lynn Canyon Park and suspension bridge; Lynn Headwaters, and the Lower Seymour Conservation Reserve. Running through all three parks is the historic Baden-Powell trail, which stretches across the entire North Shore from Horseshoe Bay to Deep Cove and was created as an initiative of the Boy Scouts and Girl Guides. The entire trail is just over 43 km long and was built in 1971 to celebrate the centennial anniversary of B.C.’s entry into Confederation. Collectively, the park trails offer year-round seasonal discoveries, views of unique geological formations, and occasional reminders of the pioneering community’s early forestry and mining operations. Watch for notches in the huge stumps you’ll see, where lumberjacks of long ago placed springboards to stand on while they used long hand saws to cut down the Douglas firs towering hundreds of feet above. Despite their proximity to residential neighbourhoods, these wilderness parks pose dangers for people who go off trail or hike unprepared. Be sure to tell someone where you are going, wear appropriate footwear, and carry water and basic first aid supplies for longer trips. And remember, you’re in mountain country – weather can change quickly, night can fall faster than you expect in the forest, and elevation gains may lead hikers to unanticipated snow and ice. Click here for some good safety and preparedness tips from the North Shore Rescue Team. This hike takes in a range of natural and park attractions, so is a great choice for entertaining sturdy-shoed visitors. Dogs allowed? Yes. Stroller-friendly? No. Time needed? Less than an hour. Want a map of the area? Click here. Bus or drive to the top of Lynn Valley Road; parking is available up Lynn Valley Road beyond the three-way stop, or around the End of the Line General Store (please be aware of the 30-minute parking limit in front of the store, and leave space for store customers). This section of the Baden-Powell trail begins at the trailhead marker across Lynn Valley Road from the store’s front door. Walk downhill and along the west side of Lynn Creek, through the salal, salmonberries and sword ferns that live under the canopy of vine maples, hemlocks and cedar trees. A chain-link fence separates walkers from the steep walls of the creek, and heeding any posted safety signs is important – rescue personnel are not infrequent visitors to the rugged Lynn Canyon area. Wooden steps lead down to the river level, where beautiful boardwalks traverse skunk cabbage marshes. Soon the broad creek takes a sharp turn, and begins its journey through the steep cliffs of Lynn Canyon. Your path will take you up several flights of stairs to the infamous Lynn Canyon Suspension Bridge, built in 1912. You can stop off here to have a bite in the Lynn Canyon Cafe or wander up the parking lot to the Lynn Canyon Ecology Centre, a by-donation haven for curious naturalists of all ages. Pushing on, you’ll cross the suspension bridge that swings 50 metres above the roaring waters below. On the other side, you’ll leave the Baden Powell trail and turn left; after walking ten minutes upstream you’ll arrive at 30-Foot Pool, a longtime local swimming hole for the brave-hearted. At this point, you can retrace your steps, or face the 160-plus stairs that will take you from the canyon floor up to the forested trails of the Lower Seymour Conservation Reserve. At that point, keep left and you will intersect the Pipeline Bridge trail that will lead you back over Lynn Creek and left up the gravel road to the End of the Line General Store. Forty-five minutes is usually ample time for the average walker to complete this trail, minus stops along the way. Further descriptions and maps are available at access points such as the general store, Lynn Headwaters Park, Lynn Canyon Ecology Centre, and in the Lower Seymour Conservation Reserve. Looking for a story about a Lynn Valleyite who takes the Baden Powell at a run, not a walk? Click here to learn about one of the elite runners in our neighbourhood! This popular walk circumnavigates a lake that was once part of the muncipal water supply, and inaccessible to the general public. Now it provides a pleasant stroll at almost any time of the year. Dogs allowed? No. Stroller-friendly? Yes. Time needed? Approximately 45 minutes, round trip. Map? Click here. Otherwise, bus or drive to the top of Lynn Valley Road; parking is available up Lynn Valley Road beyond the three-way stop, or around the End of the Line General Store (please be aware of the 30-minute parking limit in front of the store, and leave space for store customers). Starting at the End of the Line, walk north, veering right down Rice Lake Road, and cross the Pipeline Bridge. A short climb on the other side leads to the parking lot of the Lower Seymour Conservation Reserve, where you’ll see a gazebo, directional signs, and information boards giving wildlife alerts and cautions for back-country hikers. The path to Rice Lake is up the left side of the parking lot, just past the log Learning Lodge. Head north on the wide path; within a few minutes the marked access to Rice Lake will be on your right-hand side (continuing straight will lead you to the adjacent Lynn Headwaters Park, an alternate route in and out of Rice Lake). Keeping left on the Rice Lake path will take you counterclockwise around the lake. Along the way is a wheelchair-accessible dock where locals enjoy fishing for trout (all provincial freshwater fishing regulations apply). You’ll also encounter historical markers pointing out evidence of the pioneering logging operations that took place around Rice Lake in the early 20th century. At that point, Rice Lake was used to float shinglebolts and direct them into the flume lines that led to Burrard Inlet; it was also the main municipal water supply. Once you’ve circumnavigated the lake, retrace your steps to the End of the Line. The trip around the lake will take an average walker 30 to 40 minutes. Interested in a walking group that likes to ramble around Rice Lake and other easy-going local trails? Read this post to learn more. This trail was named for painter Frederick Varley, a member of Canada’s famed Group of Seven, who lived across from Pipeline Bridge in the mid-1930s. Dogs allowed? Yes. Stroller-friendly? No. Time needed? About one hour, return. Map? Click here. This trail was named for painter Frederick Varley, a member of Canada’s famed Group of Seven, who lived across from Pipeline Bridge in the mid-1930s. It can be accessed from the end of Rice Lake Road (which veers right off the top of Lynn Valley Road) or from any of Lynn Headwaters Park’s three parking lots. The 1.5-km trail is gently sloping with a few short staircases, and it leads through rainforest flora such as maples, hemlocks, firs, cedars and forest floor species such as salmon berries, skunk cabbage, salal and ferns. It will take the average walker about 30 minutes each way; a stop at Lynn Headwaters end will allow you a chance to visit the historical displays in the B.C. Mills House, and to rest in the grass picnic area adjacent to the creek (a bridge over the river leads to further walking and hiking trails that range from beginner to advanced). Also available in this area are outhouses, drinking fountains, information boards and trail maps. The Lynn Loop trail in Lynn Headwaters Park is categorized as a beginner trail on the park’s information board, and it is indeed a pleasant, 5.2 km walk, much of which parallels the bank of Lynn Creek. Be warned, though, that the journey includes a steep, switchbacked slog at its northern end – one that is only ⅓ of a kilometre long, but may well feel longer. This is probably not the walk on which to bring visitors who aren’t used to getting at least some exercise now and then! To begin, you’ll walk or drive to the parking lot at the end of Lynn Valley Road, and cross Lynn Creek via the footbridge in the Headwaters Park. Once on the other side, you’ll see the map and information board listing current trail conditions, and decide if you want to do the Loop in a clockwise or counter-clockwise direction. If you choose clockwise, you’ll turn left and spend the first almost-two kilometres traipsing along the east bank of the creek, on an easy path. Then you’ll turn right to tackle the aforementioned steep section, after which you’ll find yourself on top of a wooded ridge. You have the option here of turning left and taking the two-kilometre Headwaters Trail back down to the creek level, but to complete Lynn Loop you’ll want to turn right and take the trail that takes you on a gradual slope back down to the elevation from which you started. When your path emerges back onto the main trail, you’ll have overshot the information board from which you started your trek; just turn right and you’ll soon make your way back. Lynn Loop generally takes about 1.5 hours to complete; it’s an excellent way to enjoy the beauty of the creek, the fresh mountain air in the forest, and even a short cardio workout in a reasonable amount of time. If you happen to be in the park on a Sunday, you’ll also have a chance to poke your head into the B.C. Mills House near the parking lot, where volunteers and historical displays help visitors imagine the mining and logging operations that took place in these forests long before they became a haven for hikers and joggers. We can all guilty of taking for granted things that are right under our nose. When’s the last time you explored Lynn Canyon? Perhaps it’s been a while. In that case, you can refresh yourself with this hike, which takes in a few of the canyon trails that are a little off-the-beaten tourist track. Dogs allowed? Yes. Stroller-friendly? No. Time needed? About one hour, return. Map? Click here. This loop walk begins on the Bear Trail, the beginning of which is located just off the canyon exit road where it meets Peters. If you’re driving, you can park in the unpaved lot that’s before the ecology centre, and retrace your steps back to the gravel road to find the trailhead (marked “Ross Road Trail,” though it’s “Bear Trail” on the Lynn Canyon Park map). The first several minutes of the trail are flat and suitable for wheeled devices, and give hikers a shaded walk through typical canyon rainforest. While most of its length runs parallel (but well above) the gravel service road that connects the canyon park to Ross Road, it eventually descends and crosses this road. Just before it does, you’ll come across areas where the trail widens and flattens, and this is where earlier film crews have set up to shoot scenes from shows such as Battlestar Galactica and the Percy Jackson movies. Once you’ve crossed the service road and plunged back into the forest, you can take the first left-hand turn (onto the Beaver Trail), or you can forge ahead and take a five-minute detour down the sloped path that runs over a buried water pipe and leads down to the river – take a break on the banks for a spell! Make your way back up to the Beaver Trail, and turn north through the forest. After a few minutes you’ll come to a fork in the road; the right-hand branch will take you down to the creek again, or veer to the left to stay on our loop trail. You’ll meet up with a gravel access road, at which point you’ll turn right and soon arrive at an open clearing that heralds the start of the Centennial trail. While you can take this trail up to the Lynn Canyon Cafe, turning right and going down the stairs to Twin Falls give you a chance to see the rushing waters up close from the wooden bridge that takes you across Lynn Creek. Take the stairs up the far banks, and you’ll find yourself on the famous Baden Powell trail. Turning left will take you up to the suspension bridge and the always awe-inspiring crossing that will lead you back to the Lynn Canyon Cafe and parking lot. At that point – especially if you’ve taken some of the detours from Beaver trail down to the creek – you’ll have earned a rest at one of the picnic tables, a cool drink from the Café, or a visit into the Lynn Canyon Ecology Centre, open year-round by donation. This is a favourite quick walk for people wanting to exercise their legs or their dogs. Bikes allowed? Yes. Stroller-friendly? No. Time needed? About 30 to 40 minutes. This multi-use trail is easily accessed off the top of Hoskins Road (right where it turns into McNair) but within seconds you are surrounded by rainforest on all sides and feel miles away from the hustle and bustle of daily life. The 0.15 km trek in from the road leads past the now-fenced-off swamp that used to be a favourite wading spot for local youngsters, some of whom have memories of skating on it in winters long past. Now the pond and the woods directly around it are off-limits to all traffic in order to allow the natural habitat to re-assert itself, and frogs are once again often being heard calling from the swamp’s muddy shores. 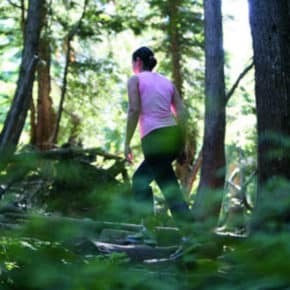 As you make your way towards Grouse Mountain Highway, you may encounter other walkers, dogs, or the occasional biker … or you may well have the forest to yourself. A final uphill scramble will bring you to the gravel road near its intersection with Thames Creek. You can head up the old highway if you’d like to build a bit more elevation into your walk, or you can turn back and retrace your steps down the Baden Powell trail. To complete a loop walk, you can simply walk down Mountain Highway and turn left on McNair Drive; in a few blocks you’ll be back to where you started. We hope you had a great day out! If you’d like to share photos or trail updates, please post your experiences on the LynnValleyLife Facebook page, or email us at info@LynnValleyLife.com.